UPDATE: We would like to thank everyone for all their generous donations. Surprisingly, we have surpassed our goal with all of your help. Any remaining donations will be used to create a memorial in Zaevion's honor. Would I/you be this brave? Number 24 is Zaevion Dobson. A son, a baby brother, and "OUR HERO"
He was a student football player in Knoxville, Tennessee. On Friday December 17th he dove on top of three girls to shield them from ma random shooting. None of the girls was injured. But unfortunately Zaevion was killed. Please assist his family in laying him to rest respectfully all donations are greatly appreciated. My name is J'Tia Williamson. I live in Knoxville. Zaevion's mother is my aunt. Zaevion & his brothers are as close as brothers to me. The money raised will cover funeral expenses. A college fund will be set aside for Zack, Zaevion's brother who was with him when he was killed. A memorial fund will also be established. The money will be transfered directly into an account where Zenobia banks. She will have total control of the account. My daughter and I have cried for 4 days. She knew him - I did not, but sure wish I had known him. His distinct character was shown in one instance...many would just run at the sound of a gunshot...this young man's first instinct was to protect the girls he was walking with. As a mother - I can't imagine being so sad, yet so proud at the same time. I will pray daily for this family - a beautiful child taken too soon from a senseless crime...and I will pray daily for our youth - these kids have dealt with more at 15 than I believe I have in a lifetime. 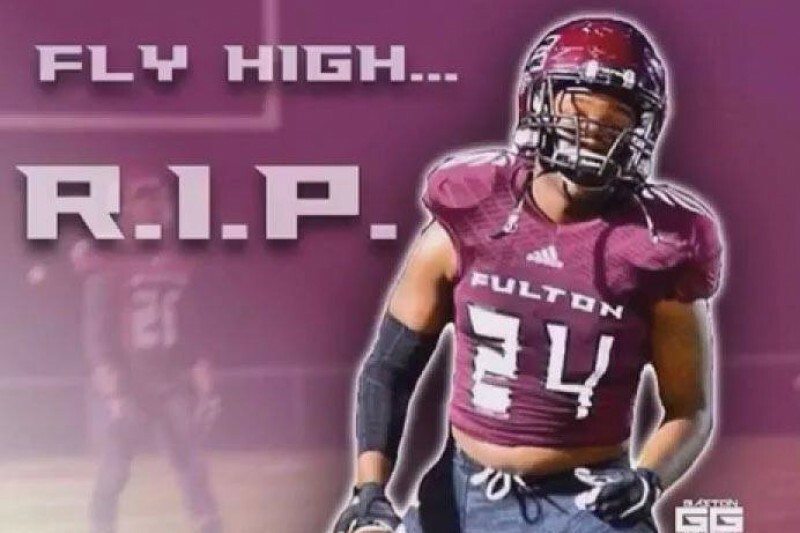 ‪ #‎ZavionIsAHero‬ ‪#‎PrayForKnoxville‬ ‪#‎PrayForPeace‬ John 15:13 - "Greater love has no one than this, that one lay down his life for his friends"
I live in NYC and didn't know this amazing young man, but this just broke my heart. To think a young life was so tragically cut short and that the world has lost another fine human being is painful. I will pray for your family and friends to find solace in knowing you are in the arms of the angels and blessed in God's heaven. I live in New Orleans, La, and heard this story and this a bittersweet moment. He is such a brave young man and God has a lot planned for him next to His thrown for sacrificing himself to save three young ladies. He earned his wings. I'm praying for the family and friends of Zaevion. A true hero .r.i.p. mr.dobson! You will forever be remembered. I am touched by this story all the way in BC, Canada. He was a great kid. Nothing can soften this incredible loss, but I hope the family knows that people everywhere -- many of them complete strangers -- are praying for them. Zaevion sounds like an extraordinary young person, and I lament, along with so many others, that we will not get to see the man he would become or the life he'd lead. All I can say is that I am very sorry this happened to this family. I wish I could offer more, this 15 year old boy leads the way for us all! We are all in this life together and need to protect one and other. To you my brother you are an inspiration to us all!!! And I heard the voice of the lord call, whom will go for us? and whom shall I send? And I ansered the lord here am I, send me! What a brave young man. I live in NC but am from Knoxville. My heart breaks for this family but yet at the same time it is uplifted by the grace and love the community is showing for him and his family. I hope the family can find comfort in that and in how many lives have been touched by his story. I have shared and hope others are as touched by this young mans courageous act as I am. LORD REST HIS SOUL. GOD BLESS THE FAMILY IN JESUS NAME. AMEN. God Bless this child and the people who raised a truly unique and beautiful soul. May other young men know and carry the honor and respect you have gained by your courage and selfless acts I pray . Now you can rest in peace with your saviour, your work here is done, but your name will forever live on! RIP FLY HIGH YOUNG MAN!!! As a mother of a teenage son myself I could never imagine the pain his mother is feeling but also, I could only hope that my son would be as courageous and brave as this young man. Zaevion you are amazing. You sacrificed yourself to save the lives of others. You are a true hero. Rest on sweet young man. Well done. As a father, I am so sorry this is happening to you. I guess you can find some solace in his act of incredible heroism. I hope this will be the last straw that will push politicians to do something about this problem. Zaevion should never have had to give his life in this fashion.